Sami Ullah, the renowned engineer, presents this useful video for civil engineering students. In this construction video, you will learn how to produce a scale drawing in civil engineering. 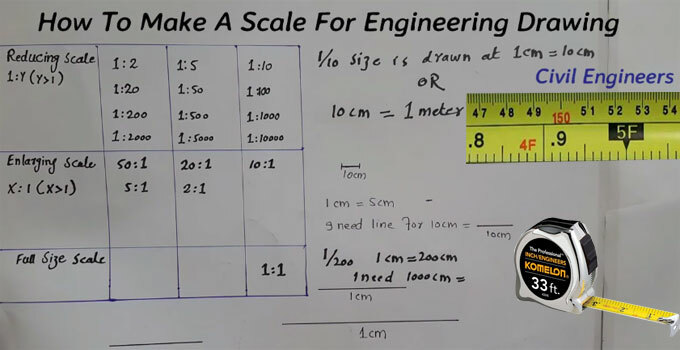 In civil engineering, scale signifies the proportion or ratio among the dimensions chosen for the drawing and the related dimensions of the object. Representing scales: The ratio among the drawing and the object is demonstrated with two systems as follows:. a) Scale: - 1cm = 1m or 1cm=100cm or 1:100 b) Representative Fraction: - (RF) = 1/100 (below one) i.e. the ratio among the size of the drawing and the object. There are three types of scales like reducing scale, enlarging scale and full size scale. Reducing Scale – It is a type of scale ideal for the surveyors to minimize chains and links to acres and roods by inspection as well as in mapping and drawing to different scales. Sometimes, it becomes essential to minimize a drawing to a smaller scale, or to determine a small fraction of a specified dimension, such fraction is not marked on the lineal measuring rules at hand. Scale: - 1cm = 1cm or 1:1 and by R.F=1/1 (equal to one). To get online demonstration, watch the following video tutorial.